We are having an inservice/Week of the Young Child event tomorrow evening at school and the staff is bringing snacks. I cut up some cheese and sausage, but felt bad that I wasn’t going to bake anything. 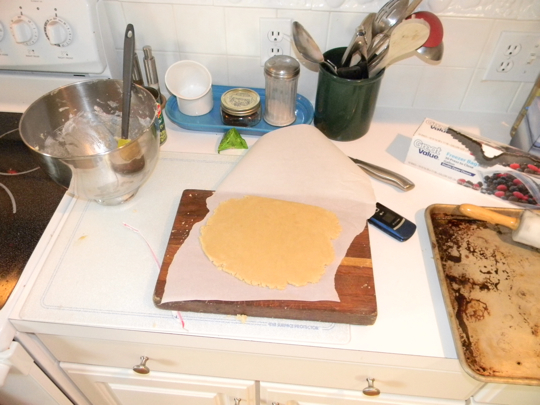 I’m pretty sure there will be plenty of food, but I thought maybe I could make shortbread. Problem: Shortbread needs sugar, and I am out. The internet to the rescue! 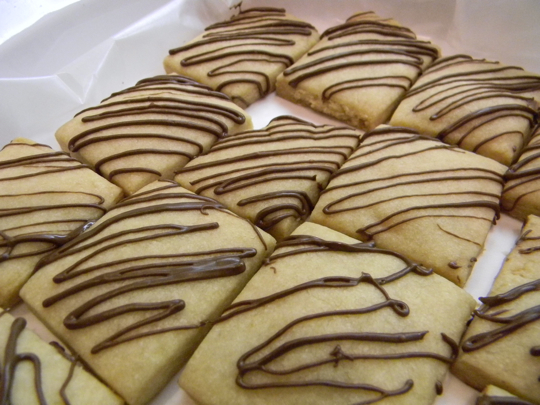 You can make shortbread with brown sugar! I halved this recipe and – Brad, you will be proud of me – followed the directions exactly. I wanted to tinker with the baking time, but didn’t. That’s a huge step towards recovery. But there’s another problem. I started making it after 7, so there’s no way that I could taste it to see if it’s good. Even if I could eat it, I don’t like shortbread, so I don’t want to eat it. There’s yet another problem. I couldn’t believe that something only made of flour, brown sugar and butter could taste good, so I thought I’d try tempering chocolate again and do a drizzle. My chocolate did not set. Dang it. All in all, I’d like to be the first to say that this was a bad idea. I hope everyone else brings food. Well, they certainly LOOK good. If they don’t taste good, maybe you could just stand by the table and tell everyone they’re just for show. Looks nice though! Just put plenty of napkins nearby for those who get chocolate all over their hands. Mmmmmm!! They do indeed look delicious! And worry not about the chocolate…..those cookies will fly off the table. I would have never dreamed those cookies were made from just those ingredients either. That’s how I make the crust & topping when I make an apple crisp. Let us know how they taste. It has been my experience when baking something for a bake sale or such, something always goes wrong. The powers that be somehow know that this baking matters and mess it up.